Emergency dental clinics exist so that you don’t have to wait till the morning to go to the dentist and wait for hours before you finally get to go in for a checkup. They are there for you so that when suddenly, in the middle of the rush hour or late night, you start to feel some discomfort with your teeth and need professional help, you can turn to them. The dentistry offers all kinds of preventive care along with the normal dental solutions like toothache problems, chipped tooth problems, cleaning, examining, etc., so that once they solve your problems they do not come back to haunt you again. These clinics have trained staff who are very careful about their patients and very professional in their work. You need to visit a dentist right away before things get worse for you and your teeth. The metropolitan city of Norman is 20 miles south of downtown Oklahoma City and is the third largest in Oklahoma, with a population density of 118,197. The city is the county seat of Cleveland County and is a real busy place in the middle of all the hustle and bustle. In the everyday rush of the daily life, many people forget the usually non-problematic, but very essential part of their health, that is- their dental hygiene. We have made a list of the top dentists that are qualified, and always available to be of help to you. Find Oklahoma 24 hour dentists today. 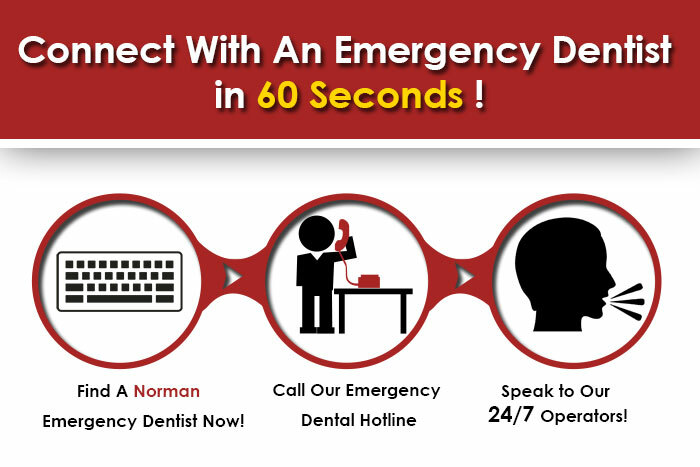 Norman Dentistry uses advanced dental technology to help you with your problemsfaster. Their address is 515 S. University Blvd., Norman, OK 73069 and their phone number is (405)322-5586. Call them at anytime to set an appointment, or just drop them a visit. The best thing about Aspen Dental is that they give every new patient a free check-up and X-ray. All you have to do is make an appointment with them by calling their number (877)277-4354. The clinic has six different offices in Norman, Oklahoma for your benefit, so do not hesitate to call them and inquire if they have an office in your neighborhood. The dental services offered by this clinic on emergency basis are- tooth ache relief, swollen jaw relief, cracked tooth, loose fillings, sore gum relief, root canal therapy and dental repair. 1020 24th Ave NW, Norman, OK, 73069. If you are having toothache for a few days in a row, then chances are that something is wrong with your teeth that won’t just go away with time. Potts Geoff is the best place for you during emergencies like this. They provide services like broken tooth repair, chipped tooth repair, teeth cleaning, placement of crowns, bridges and veneers, dental braces, dental cleaning and examination, dental implants, dentures, etc. To get in contact with them, call at (405) 217-4684 or visit them at 1020 24th Ave NW, Norman, OK, 73069.